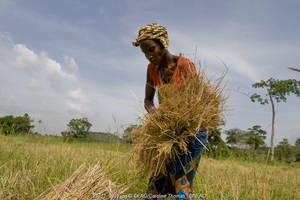 A Sierra Leone farmer bundling harvested rice to be threshed. 2 December 2014, Rome/Accra – Guinea, Liberia and Sierra Leone, the countries hardest hit by the Ebola epidemic, will each receive 0 000 to help curb the potentially devastating impact of the disease on food security and on the livelihoods of farmers and others in rural areas. The .5 million grant comes from the Africa Solidarity Trust Fund and will be used in support of FAO’s recently launched Regional Response Programme to tackle food security and agriculture issues related to the Ebola Virus Disease (EVD) outbreak in West Africa. The funds will be used over a 12-month period to assist 7 500 households – about 45 000 people – in the three targeted countries. Activities include social mobilization and training to help stop the spread of EVD; the strengthening of savings and loan schemes, particularly those involving women beneficiaries; and the provision of agricultural inputs to help rural families safeguard their livelihoods and incomes. The agreement is one of three signed today in which the Africa Solidarity Trust Fund is granting a total of .5 million to support FAO’s work in continent-wide programmes including youth employment in rural areas and South-South Cooperation. “The grants made available today signal the ongoing willingness of African countries to assist each other, not only during times of urgent need, as is the case now with the Ebola crisis, but also to secure their continent’s future growth and prosperity”, said FAO Director-General José Graziano da Silva. “The Africa Solidarity Trust Fund for Food Security is a unique initiative for mobilizing resources from Africa for Africa with potential to help wipe out hunger and build resilience of vulnerable people”, declared, Crisantos Obama Ondo Ambassador of Equatorial Guinea to the Rome-based UN agencies and Chair of the Steering Committee for the ASFT. Last month FAO appealed to donors for the estimated million urgently required to mitigate the impact of EVD on the food and nutritional security of affected communities in Guinea, Liberia, Sierra Leone and neighbouring at-risk countries. FAO has already committed around .8 million of its own emergency funds to the agency’s Ebola Regional Response Programme and the grant made available by the Africa Solidarity Trust Fund is a much-needed contribution to FAO’s efforts. The other two agreements signed with the Africa Solidarity Trust Fund will support two FAO programmes: helping to create jobs for young people and women in the continent’s rural areas; and safeguarding food security in Africa through South-South Cooperation amongst African countries. The programme on enhancing employment opportunities for rural youth, run by FAO in partnership with the African Union’s New Partnership for Africa’s Development (NEPAD) will receive million. Activities include helping countries to draw up and implement policies to boost enterprise development in rural areas and the transfer of entrepreneurship skills. Today, the FAO Director-General and NEPAD Chief Executive Officer, Ibrahim Hassane Mayaki, signed a Letter of Intent through which the two organizations agree to join forces to implement the project. “This programme is a concrete way to empower young men and women with the necessary capacities and skills to engage in the socio-economic transformation of their countries. The joint implementation of the programme demonstrates the strong partnership that exists between FAO and the NEPAD Agency,” Mayaki said. The second initiative relates to Africa’s South-South Cooperation Facility for Agriculture and Food Security. It will receive million to support African countries share and exchange development solutions including knowledge, expertise, best practices, innovations, technologies, innovative policies and resources. The Africa Solidarity Trust Fund was launched in 2013 as a unique Africa-led initiative to improve agriculture and food security across the continent. It includes contributions from Equatorial Guinea ( million), Angola ( million) and a symbolic contribution by civil society organizations in the Republic of the Congo. Since its inception, the Fund has already provided financing for projects in 30 countries including building resilience for conflict affected rural communities, reducing rural poverty through youth employment opportunities and building best practices to increase crop and livestock production. Administered by FAO in partnership with key collaborators, the Fund aims to pool resources from Africa’s strongest economies and use them across the continent to implement initiatives in the framework of the African Union’s Comprehensive Africa Agriculture Development Programme (CAADP) to boost agricultural productivity and food security in the region. It is governed by a steering committee currently consisting of Equatorial Guinea, Angola, the Chair of the Africa Group, the Chair of the Regional Conference for Africa, the African Union and FAO.